These Teashirts are made from 100% cotton and are hand dyed - the colour may vary in shades due to the hand dyeing process. 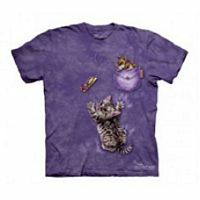 These detailed cat / kitten designs are professionally printed and will not wash out, it's actually embedded in the fabric of the shirt. These Teashirts are pre-washed, pre-shrunk and were made using water-based inks and dyes - good for the environment and free of chemicals that may harm your health. Small is an AUS 12 (Around chest is 91.6cm or 36 inches). Medium is an AUS 16 (Around chest is 102cm or 40 inches). Large is an AUS 18 (Around chest is 110cm or 44 inches). X Large is an AUS 20-22 (Around chest is 120cm or 48 inches). 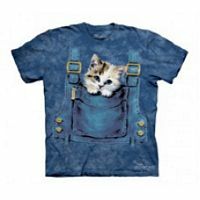 This amazing t-shirt has a design that looks as if you're wearing overalls and have a cute little fluffy kitty in your pocket - a unique design for cat lovers! 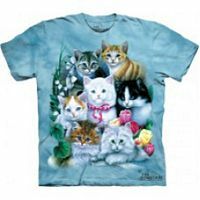 This light blue mottled dye teashirt is called Fluffy White Kitten - for the huge portrait style print of one very sweet looking kitten that's printed on the front of the teashirt. This adorable kitten teashirt is called Fishin' Kitten and has a gorgeous little black / tortoiseshell kitty reaching into a round fishbowl and flipping a goldfish right out of the bowl! A fun design for anyone who loves cats. This is printed on a purple tie dye tee. 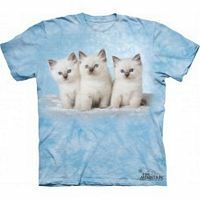 This light blue tie dye t-shirt features three sweet little blue eyed kittens sitting on a cloud in the picture and it's titled Cloud Kittens. 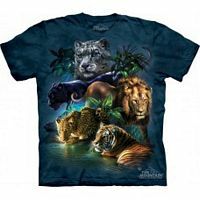 Our Big Cat Collage t-shirt features a collection of big cat images including tigers, lions, cheetahs and a black panther. Price quoted is for 1 Big Cat Collage Teashirt. 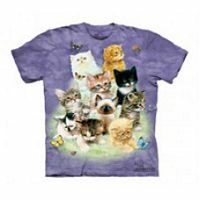 This dark tie dye features an array of colourful big cats in a design known simply as Big Cats Jungle by The Mountain. Included in the print is a tiger, panther, leopard and lion - a true delight for lovers of big cats and wildlife in general! 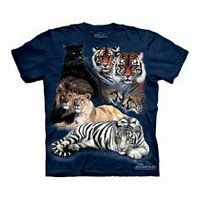 Price quoted is for 1 Big Cats Jungle Teashirt. This gorgeous Teashirt features 10 different little kittens of various breeds! A very cute image on a hand dyed t-shirt. Price quoted is for 1 Ten Kittens Teashirt. This delightful Teashirt features two mice in the printed on pocket, looking down at a beautiful little kitten that is crawling up the shirt. There's a mousetrap nearby, let's hope the kitten doesn't step on it! Price quoted is for 1 Trapped Teashirt. 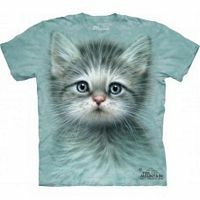 This Teashirt features a gorgeous little domestic kitten in a design simply known as Striped Kitten Face. Price quoted is for 1 Striped Kitten Teashirt.